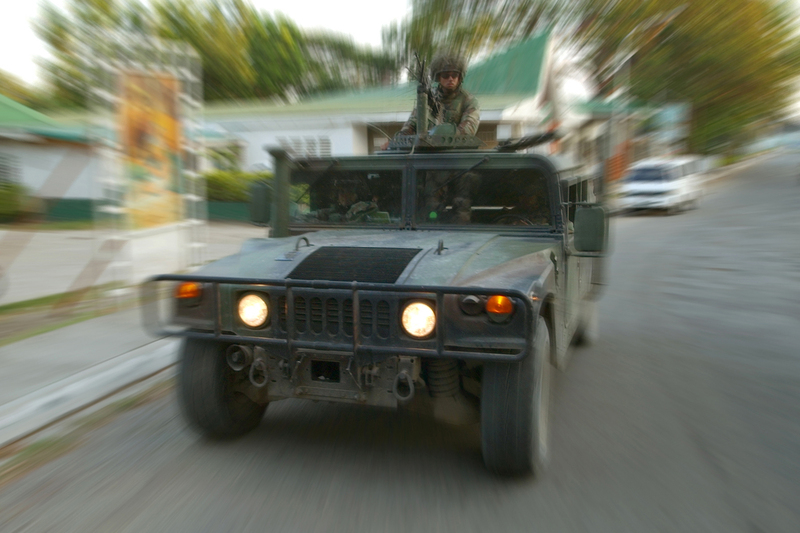 030415-N-6501M-004, Zamboanga City, Republic of the Philippines  U.S. Marines Lance Corporal (Lcpl) Ruben Reyes (Turret), Corporal (Cpl) Ernesto Gonzalez (Driver) and Corporal (Cpl) Jorge Valdounial (Assistant Driver), attached to 3rd Battalion, 3rd Marine Kilo Company, are on a routine patrol at Camp Navarro in Zamboanga City, Republic of the Philippines. U.S. Marines attached to 3rd Battalion, 3rd Marine Kilo Company are part of Joint Special Operations Task Force  Philippines (JSOTF-P), and provide Force Protection for U.S. Military and Civilian personnel as part of Operation Enduring Freedom – Philippines. Cleared for public release by Major John Amberg, JSOTF-P Public Affairs Officer.